Mobile bookkeeping is to business travel as Jenny is to Forrest Gump. As the Internet is to computers. As cookie dough ice cream is to a broken heart. It was made for business travel! The ability to track your spending, scan your receipts, complete expense reports, and to do it all before you get back to your hotel room turns stressful business travel into an all-out vacation. Let’s look at the day in the life of a savvy business traveler using mobile bookkeeping to make her life oh-so-much-easier. Check in for flight from airport shuttle. Download boarding passes to smartphone. Effortlessly enter airfare total to expenses using Freshbooks app. Shazam! Toss the receipt and admire your clutter-free carry on. Marvel at the fact that thanks to mobile bookkeeping, you’ve traveled thousands of miles in a few hours and haven’t a slip of paper to show for it. Phew! What a day! By taking her accounting on the go, and tracking everything in real time, our savvy traveler was able to actually focus on the purpose of her trip (the conference, of course). With so much mental energy freed up, who knows what she’ll do next? 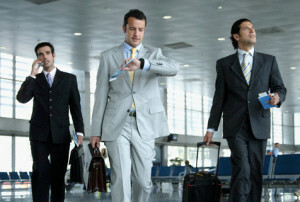 On-the-go accounting is a no-brainer, especially for business travelers. There’s nothing more tiresome than finishing an exhausting day of travel and thinking about the suitcase-full of receipts that need to be totaled, or wondering which expenses you’ve forgotten to track. Mobile bookkeeping also makes taxes at the end of the year a complete snap. The hours spent digging through paperwork and trolling various email accounts for MIA expenses are a thing of the past. It’s also a great way to track personal spending, and get real-time updates on how you’re maintaining all of your various budgets. Being able to see that your spending account is already tapped out for this month will help you resist the urge to splurge on those new Manolo Blahniks or that cool old-fashioned shaving kit. What does a day in your mobile accounting life look like? Goodbye Messy Desk – Today is National Clean Off Your Desk Day! Receipt Organizer … By Mail!